The legendary birthplace of the Greek goddess Aphrodite and the capital of western Cyprus, the city of Paphos showcases an abundance of archaeological, architectural, and historical sites. Explore hidden gems such as Aphrodite's Rock Brewing Company and Latchi Beach. Get outdoors at Coral Bay and Aphrodite's Rock. 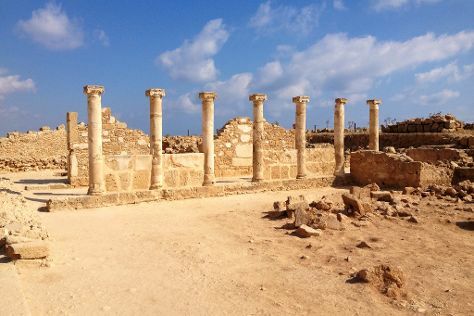 You'll find plenty of places to visit near Paphos: Aphrodite Trail (in Latchi), Akamas Peninsula National Park (in Neo Chorion) and Kourion Beach (in Limassol). And it doesn't end there: take an exotic tour of a safari tour, see the interesting displays at Local Ethnographic Museum of Geroskipou, explore the striking landscape at Sea Caves, and take in breathtaking views at Avakas Gorge. For photos, traveler tips, more things to do, and more tourist information, you can read our Paphos trip itinerary website . If you are flying in from Israel, the closest major airports are Paphos International Airport, Ercan International Airport and Larnaca International Airport. In April in Paphos, expect temperatures between 26°C during the day and 13°C at night. Cap off your sightseeing on the 22nd (Mon) early enough to travel back home.